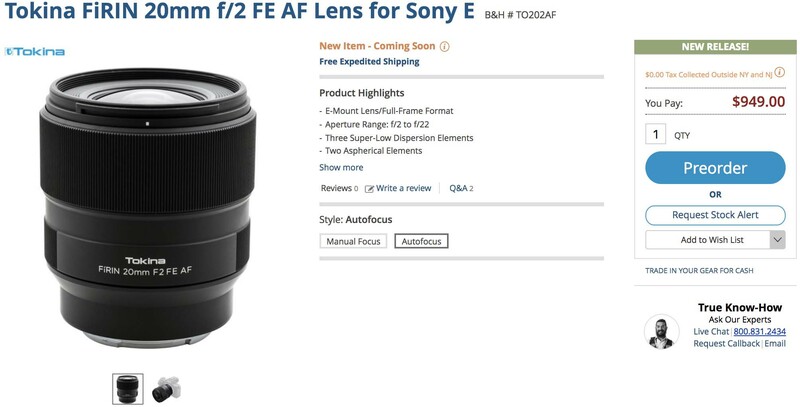 B&H Photo and Adorama are now accepting pre-orders for the Tokina FiRIN 20mm f/2 FE AF. Amazon should start accepting orders soon. April 06, 2018 – Kenko Tokina Co., Ltd. is proud to announce the sales release of Tokina FíRIN 20mm F2 FE AF – the second prime lens in Tokina’s premium lens series FíRIN for mirrorless cameras. FíRIN 20mm F2 FE AF belongs to the newly launched “FíRIN” series of Tokina lenses for mirrorless cameras (or ILCs – Interchangeable Lens Compacts) marking a new epoch in Tokina history. FíRIN is a variation of Fírinne – the old Irish word for “truth”. It means “that what is real” and signifies “being true to someone or something”. It represents a promise from Tokina to photographers to help them capture the truth in their images with this revolutionary new lens. FíRIN 20mm F2 FE AF is the long-awaited autofocus version of the existing FíRIN 20mm F2 FE super wide angle lens for full-frame Sony E-mount. Being specially designed for Sony E-mount and adopting the same optical design as in MF model, FíRIN series now offers more options for end-users to choose from according to the purpose and style of shooting. For more information about the product refer to FíRIN 20mm F2 FE AF product page. This entry was posted in 3rd Party Lens and tagged FíRIN, Tokina, Tokina FiRIN 20mm f/2 FE AF, Tokina FíRIN 20mm f/2.0. Bookmark the permalink. Trackbacks are closed, but you can post a comment.